Posted by Yilan in Byzantine, Yunanistan. Within the last two centuries, we have seen the western literature label the Eastern Roman Empire (Byzantine Empire) as “Greek Empire”. Once again this is largely to the inventions and distortions of the western historians of the 19th century, who also falsely ascribed “Greek” ethnicity to the ancient Macedonians. These people took the fact that Greek was used as the language of the Empire and declared that the Empire was ruled by “Greeks”, had “Greek” armies, “Greek” churches, and “Greek” art. In other words they spoke of the Byzantine Empire as a “Greek Empire”, a view which had been completely supported and propagated by the modern Greeks as well. Along with distorting the ethnicity of the ancient Macedonians, the labeling of the Eastern Roman (Byzantine) Empire into “Greek” is one of the greatest fabrications of the western and modern Greek writers. Although it is true that Greek was used as the language of the Empire, that can not be taken as proof that the empire was “Greek”. Latin was the original official language, imposed by the Romans who established and ruled the Roman Empire. In 395 AD when the Roman Empire split into western and eastern (Byzantine), Latin continued to be used as the official language but in time it was replaced by Greek as that language was already widely spoken among the Eastern Mediterranean nations as the main trade language. Yet the Emperors, the Church clergy, the army, and the artists, although they spoke Latin and Greek, where not exclusively of Greek ethnicity. 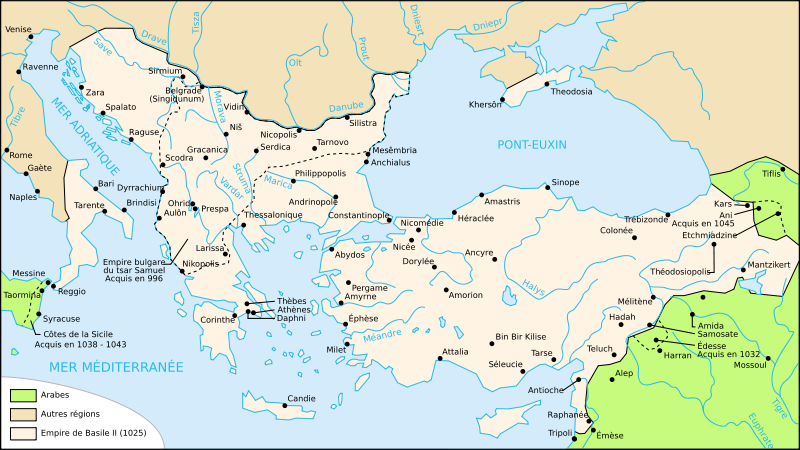 The Empire was made up of many nationalities – Thracians, Macedonians, Illyrians, Bythinians, Carians, Phrygians, Armenians, Lydians, Galatians, Paphlagonians, Lycians, Syrians, Cilicians, Misians, Cappadocians, etc. The Greeks composed only a small portion of this multi-ethnic Empire and evidence shows that they did not posses much of the power either, for we know exactly who were the Byzantine Emperors, and we know they were not ethnic Greeks. The earlier Byzantine Emperors were Romans but in time people of different ethnic backgrounds ruled this multi-ethnic empire. It is known that the empire reached its zenith while it was ruled by the Macedonians while the Macedonian Dynasty was on power for almost two centuries. Other dynasties that ruled were the Syrian, Armenian, Phrygian (Amorian), and other emperors were of various nationalities. Having in mind the ethnic diversity of the empire, the Church clergy, the army, and the artists, also came from the many different nationalities, and were not exclusively ethnic Greeks. The Byzantine historians often speak of “Macedonian army”, “Thracian army”, “Roman army”. The Thracians, Macedonians, Illyrians, Bythinians, Carians, Phrygians, Armenians, Lydians, Galatians, Paphlagonians, Lycians, Syrians, Cilicians, Misians, Cappadocians, had to speak Latin and Greek in order to communicate among themselves, but they must have used their original languages to communicate within their own ethnic boundaries, which of course does not make them “Greeks”. Thus it is inaccurate to call the Byzantine Empire a “Greek Empire” and falsely ascribe its greatness to the Greeks, when in fact it is the non-Greeks who gave the greatest contribution in its progress. The inaccurate 19th century western historiography needs another major revision, just like the one it already went through regarding the ethnicity of the ancient Macedonians. Otherwise it will continue to be unreliable and biased.